Done, but not finished. 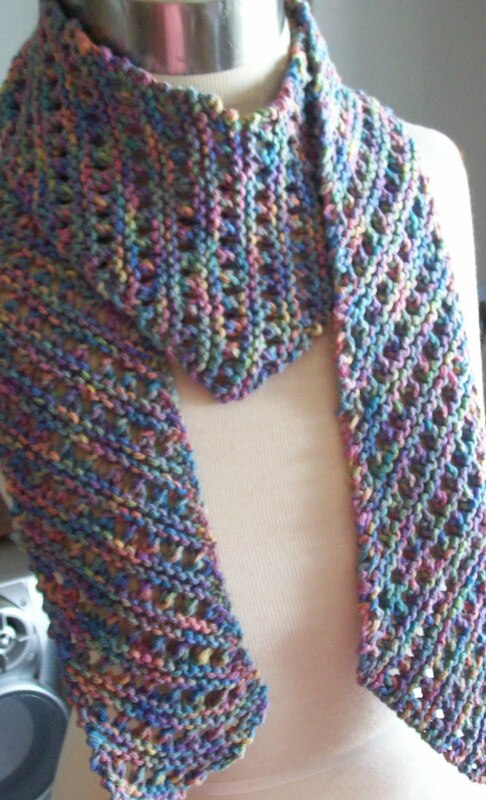 The shape is a giant V, and it can be worn with the V in front and wrapped in back and the tail brought to the front. Or it can be worn with the point of the V in back and tied in front. Likely it will be worn both ways –at different times. I've weave in the ends tonight, and it will be finished. And just the thing to wear now—when its 45° in the early morning, when I am leaving for work, and 65° by mid day when I am leaving for home. When I need something more than just a shirt—but I don't want to wear a jacket. 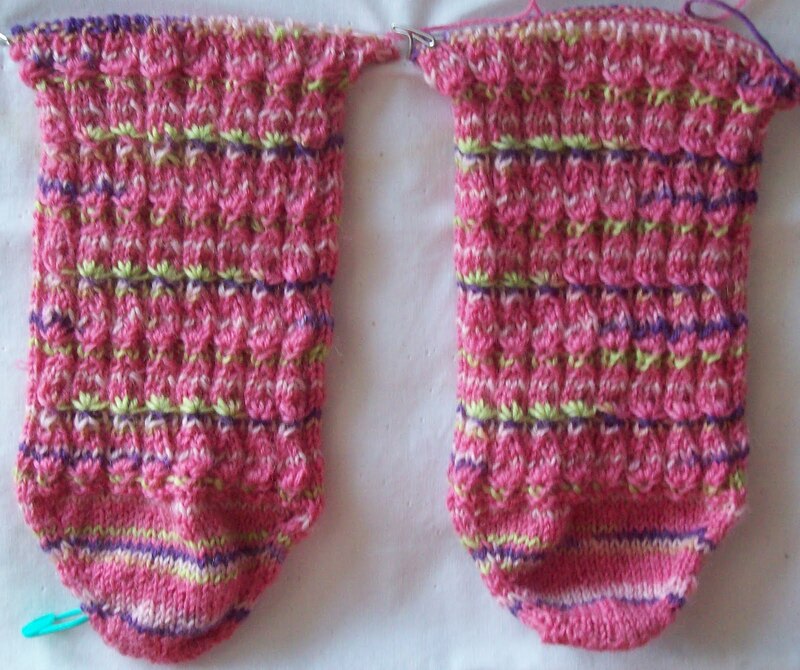 The Cotton candy socks are edging towards seven inches completed. Last night I started to shape the architectural detail heel—it's going to be like a classic trim—Egg and dart. The dart is a version of my common side gussets that I use in afterthought heels all the time, but bigger. The egg is going to be a short row oval to further shape the heel. I think it will work.. We'll know in a day or two! If it doesn't—well all won't be wasted—there are several styles of heels that use increases on the sole for shaping the heel. You can't really see the beginnings of the dart yet: So here are 6 (and some) repeats of the stacked up cotton candy cones that make up the front of the sock. I think these socks are going to end up a bit shorter than my usual socks. The reasoning behind the toe up design was to be able to make sure I had a foot that fit, and then to work to the end. The center pull cakes of yarn are looking very hollow—I'm not worried about running out, well, not yet. But I don't think I'll end up with a 9 inch leg/cuff. Maybe a 7 inch one. And then there are these—a pair of Zesty socks from before Ravelry, and before I blogged. Patons Kroy sock yarn in a color way that is called just Orange, (IIRC!) 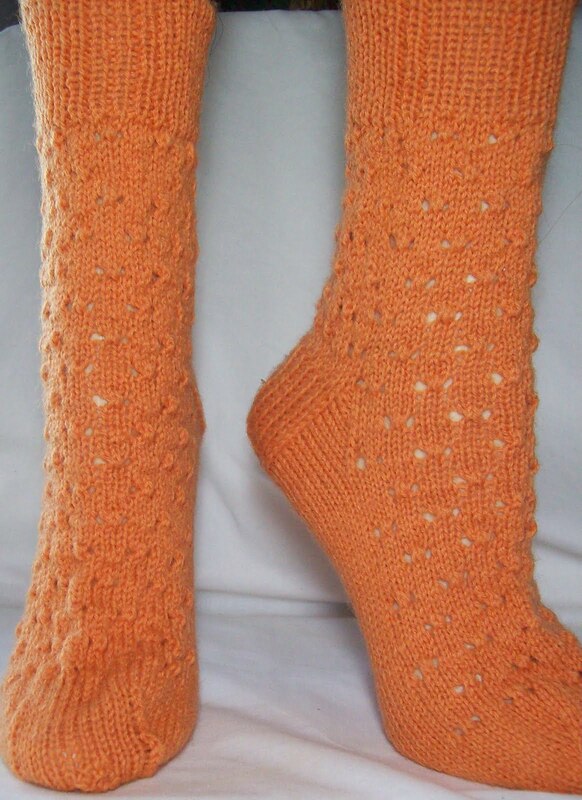 Knit with a stitch pattern to look like the textured surface of a orange peel-- I really like these sock: the way the color and the stitch pattern work together, to create something special. I might end up with some lemon zest socks, and even some lime zest socks. A family of citrus zest socks! The differences between the texture of an orange peel or a lemon peel or lime peel is pretty insignificant. I love these socks even though I almost never wear orange –and these socks, more than 5 years old, are pristine (unworn!) I love them, but I don't have much occation to wear them--not one in many years! And in spite of not wearing orange, (and never having worn these orange socks) I still some how managed to end up with 4 more skeins of Kroy in the same color. Some of the skeins will be over-dyed: with a pink or raspberry food dye to get something close to a coral—and some will be used in the Roy G Biv socks, and some will be used as trim with other colors or stripes. That's the problem with finding sock yarn remaindered and on sale (in one case, bandless and marked down to $0.50!) I end up buying it—even if it is orange! The scarf really turned out nicely. Very pretty! Not so barfy now that it's knit up! I just love your mannequin legs - what a great way to show off all your beautiful socks.